I was invited to this really cool event called ORD Camp. ORD Camp is unique, yearly event put on by Inventables and Google in Chicago. It brings together 200 people with a far range of interests. The common thread is a exceptional passion for what you do. You are encouraged to bring a “creation /invention” you are working on. I did not want to bring the 2.x laser because it is hard to move around, it takes up a lot of space, and is not real conducive to just operating in the middle of a room. I will probably bring the camera slider, but I really felt like using the opportunity to create something new and cool with the MakerSlide material. 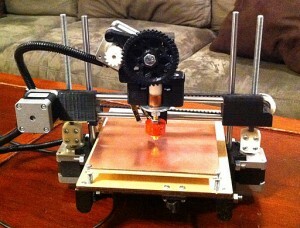 I was recently inspired by this Kickstarter Printrbot 3D printer. 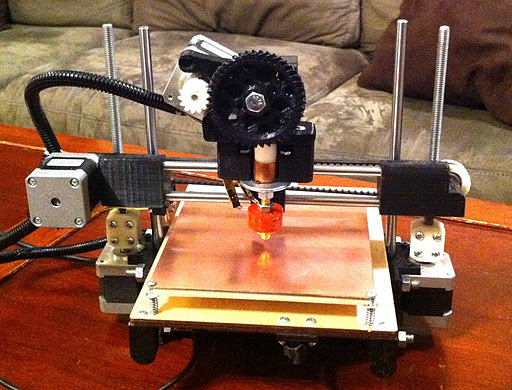 It seemed like a real ‘outside the box’ look at 3D printers. Brook of printrbot contacted me recently about collaborating with some of the people he is working with on some projects which got me more inspired. I decided to try a similar concept using Makerslide. MakerSlide has these main features. It is a linear bearing. It is a structural element. It is accurate and it is cheap. The concept is, if you keep some of this laying around and have access to a few tools, you can quickly brainstorm an idea and fabricate it right away. This project was hashed out in about 3 hours, fabricated in about 2 hours and assmebled in about 2 hours. That includes cutting all the custom parts. 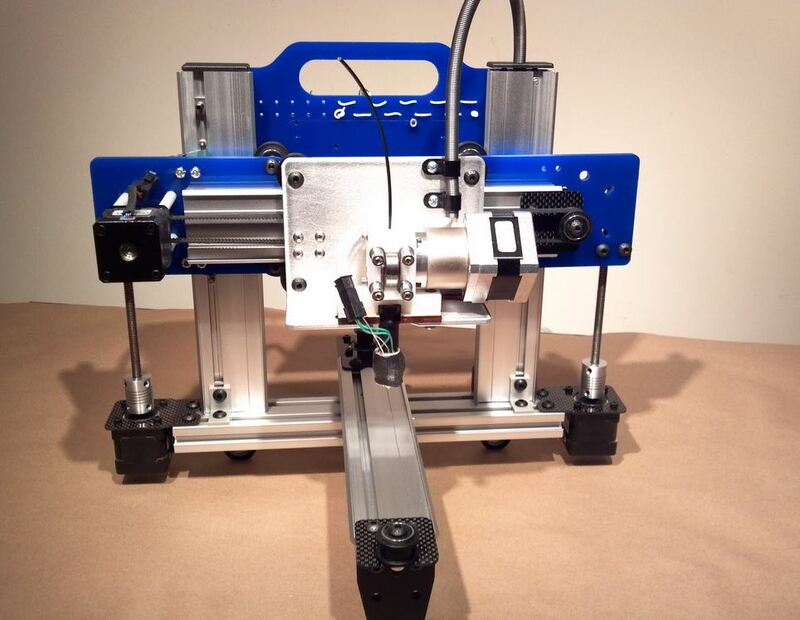 The result is the ORD Bot 3D printer platform. The structure and linear bearings are 100% MakerSlide. The motion is smooth, ridged and accurate . The parts are cheap. This uses less than $60 dollars worth of MakerSlide rail, wheels and idler pulleys. The rest are off the shelf items or fabricated by CNC router, laser cutter, 3D printer or other means. A huge feature of this design is the scalability. It can scale in X,Y, Z or any combination by simply using different lengths of MakerSlide. All brackets stay the same. You might need to change belt lengths, but all the belts are open ended belts, so you don’t need the exact length, just some belt stock. The lead screws also need to change if the Z changes, but that is standard cut threaded rod. The version I built is probably as small as you would ever want to go, so I called it the Quantum ORD Bot. The build area is slightly larger than a standard MakerBot. The frame is extremely ridged. Cut squareness does not matter very much. Every parts has multiple adjustable points and does not rely on the quality of any cuts. Parts can be aligned with a square and bolted down. I initially had some screw on leveler feet in the design, but after some design tweaks, extra bracket were going to be needed to mount them. I made these feet out of HDPE. They are soft and will not scratch any surface. I added the holes at the bottom to get a little spring to them, but I also think it brought in a nice design element. The rounded end and three point contact make them self leveling. The rear feet also act as a secondary brace for the Z axis. The handel is not required, but adds a lot of strength, can be used to mount electronics and also serves as a gauge for alighning the uprights. If you use a handle and scale the X axis you would need a hew handle. An alternative is to use a standard 20×20 t-slot piece across the top. Here is the build area increased by 100mm in each direction. I put a 20×20 extrusion across the top instead of the handle. I just did it as an example to show a more easily scaled version. This cost would be $4 higher for the MakerSlide about $3-$4 more from Misumi, about $2 more for longer lead screws and about $5 more for the longer belts. You would also need a bigger build platform (not shown). The total increase is easily less than $20. The increase in Z weight is about 4 ounces (0.1kg). At very large widths you might want to add a second Y axis extrusion, but that would just be a repeat of the existing one. The pictures above are mostly renderings. Here are some real pictures of the prototype. I cut all the parts on my CNC router. I could have used my laser cutter, but I wanted to make a few counter bores for some screw. I don’t think that is needed, but it looks cool. I also used some optional non laser cuttable materials like carbon fiber and HDPE. I came up with this idea about 6 days before the ORD Camp date, so I was a little rushed. The biggest problem was lack of motors. I also was so busy that I really could only allocate about 6 hours to the project. I let the delivery time of the motors set the schedule so only worked an hour or so a day over the week. This design is very strong. I could stand on it or hang from it without damaging it. It is quite light at about 6.25 lbs. I am very happy with it and hope to get some good feedback at ORD Camp. The element I really liked when I did some initial renderings was the clean look. I knew it would quickly turn into a RepRap hair ball as I wired it, so I decided to take advantage of the built in passage ways in the MakerSlide. I drilled some holes into the faces in some areas to pass the wires from extrusion to extrusion. The wires to the gantry had to be exposed because they move with the gantry. I put the wires into an extrension spring. This is a 1/4 O.D. 0.018 wire springs. If you stretch a spring the diameter reduces. I used this feature to mount the spring. I drilled holes slightly less than 1/4″ and stretched the spring through the holes. When I released the spring the diameter expanded to fit snugly in the holes. I tried to find a tap that matched a spring pitch so I could just thread the spring in, but couldn’t find a match. This mod falls into the “its not worth doing, unless you overdue it” category. I also wanted to reinforce the extreme rigidity look, by using carbon fiber parts, but the budget limited me to just the small thin parts. Again, this was overkill and just for fun. If there is any interest, I might add this as a kit to the Makerslide store. I would like to quote all the carriages and brackets in aluminum, so I don’t have to fabricate much. I would probably need a 50 piece buy to justify the work and cost. You can get the source files at Here. Here is the ORD Bot running at 160mm/sec, but the current print speeds are exceeding 400mm/sec with 1000mm/sec rapids. The limiting factor right now is the extruder, but we have preliminary prints close to 500mm/sec. 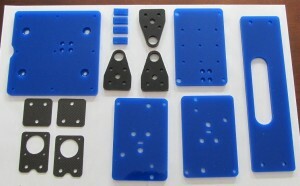 If you offer this as a kit, I’d increase the build volume to at least standard reprap mendel size of 200x200x100. That would make it compatible with reprap components like the heated build platform and such. If you do decide having a go at a kit, make the print area something like: 210x300xZ! A) Users or their friends get a very real feel for the print surface and walk around with a sheet that size and: “Oh, I can print this and this… !?”. B) Buy a very thin A4 polycarbonate sheet for their printsurface, as PLA stick very firmly to that material. Trick is, to put very little cooking oil on the surface then it just pops right of! Yes, do as John suggests (increase the size to be appropriate for the standard PCB heatbed commonly used on repraps), and you’d have my order for a kit in a heartbeat (and my heart is beating pretty fast right now). Right now it uses identical lengths of Makerslide (230mm). My goal is to kit a single standard size and let people mod it from there. I can increase the current design to fit a standard build area. Please suggest a good standard heated bed that is good and low cost. I’m very excited about this. 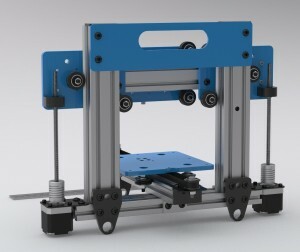 Been wanting to build a reprap out of makerslide for a while. I too agree that this current design’s bed is too small but I understand the rationale that you want to keep it consistent for now. As for the heated bed, shameless plug but I’d recommend something like this. 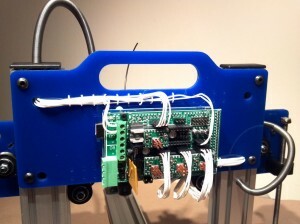 Everyone can custom build their own bed that is as scalable as this ORD bot design. Aluminum is easily available and workable. There is no need to rely on ‘standard’ PCB heated beds. @Pazu – The point isn’t to rely on the “standard” PCB, but to choose a good size for the standard Quantum kit. The prusa bed is, IMHO, the “goldilocks” size, neither too small nor too large. Toss in the fact that a lot of people already have heated beds that size could only help make the potential kit more popular, since people would be able to move their electrical bits over to the Quantum without further investment of time and money. I was planning to build a cnc router next but think that may change to Quantum ORD. I still have not ordered my original MakerSlide reward, and will probably use that for this. I agree with most of the others, that the “standard” size you design will have a great impact on how many people actually order. Too small and it is a toy. Too large and there is no place to put it. The 200×200 to 300×300 range is probably ideal. Hope to see a solid price quote and final specs on this soon (like you have nothing else to do). A beautiful design that will get lots of people into 3D printing – me included. Yes–offer a kit. This looks like the first printer to get for us. Wow, I really like the clean look of that thing. And the first idea that came into my mind was: make the y-axis (and the build platform) “foldable” – if you had a hinge to turn that like a swivel arm upwards, you would get a nice package that could be handled by the grip/handle that’s already incorporated in your design. You’d need a lot of (build-)room on the z-axis, but that still might be an option. If you think this has has enough rigidity for PCB milling then consider be 80% sold. 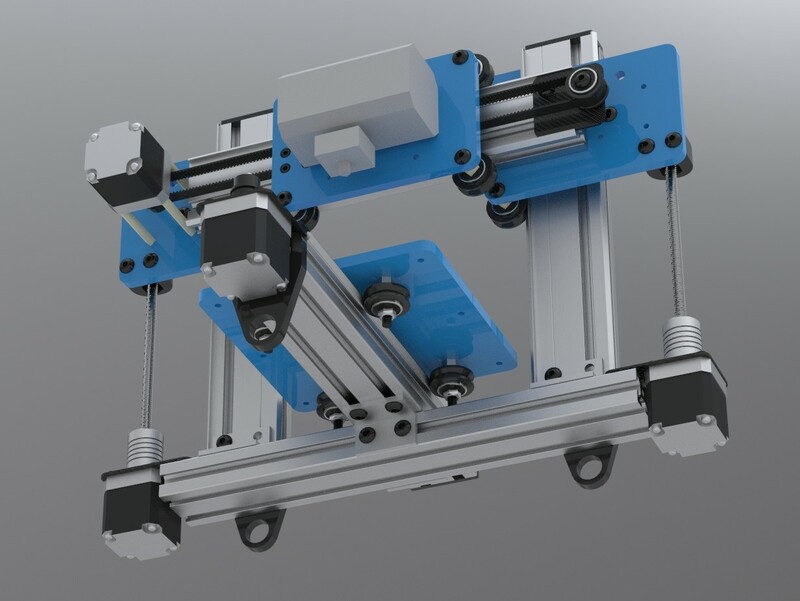 If it’ll PCB mill and you can kit all the hardware as well (brackets, threaded rod, etc, these can be hard to come by outside the US): where do I send the money? 200 x 200 x 200 print area is my vote. I would be ideal if prusa’s mk1 pcb heat bed fit it. Add me to list if that’s the case. In addition to the full kit, offer one with just the brackets so people can scale as they see fit. I would love it if you published your drawings and I would make a MakerSlide order next month! If you did happen to offer a standard kit, I’d be very willing to purchase a nice amount of the first batch if all turned to be well. Want to build one!! When, where, how to buy the kit? I would also be willing to buy a kit. 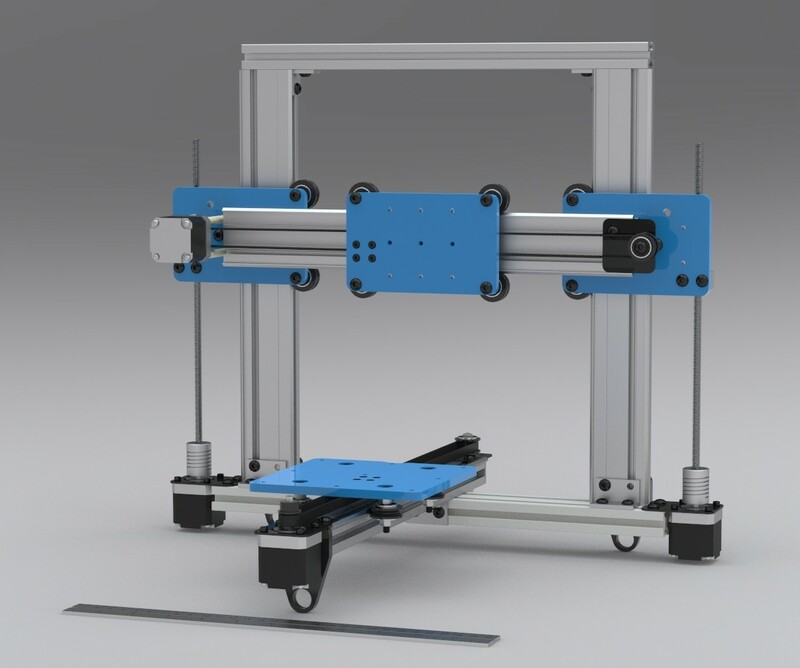 This is a next gamechanger (after printrbot). Please offer kit as soon as possible. Very nice design! I think this is a great and clean solution! Size may indeed be a little bigger. My only remark is that you should use prob install trustbearings on your Z-spindle. The couplers on the stepper work like a spring so accuracy may lack on Z. You could have a capping surface running on top from left to right and install the bearings there. That is an excellent point about the couplers. I will look for a better solution. Just keep it simple, a 608 bearing with two nuts locking it in would do the job I presume with these small forces. Are you using 8mm or similar? Otherwise adapt the bearing to the screw size. If the top-part could be made in angled aluminum you could have the bearing mount aswell a reinforcement structure combined with a handle. I am definitely interested in buying a kit. I personally feel you should go with a build envelope similar to the Huxley for your build platform. You could count me in for a kit if you do it. I suggest using kickstarter? I hope to be printing within the week on the ORD bot. 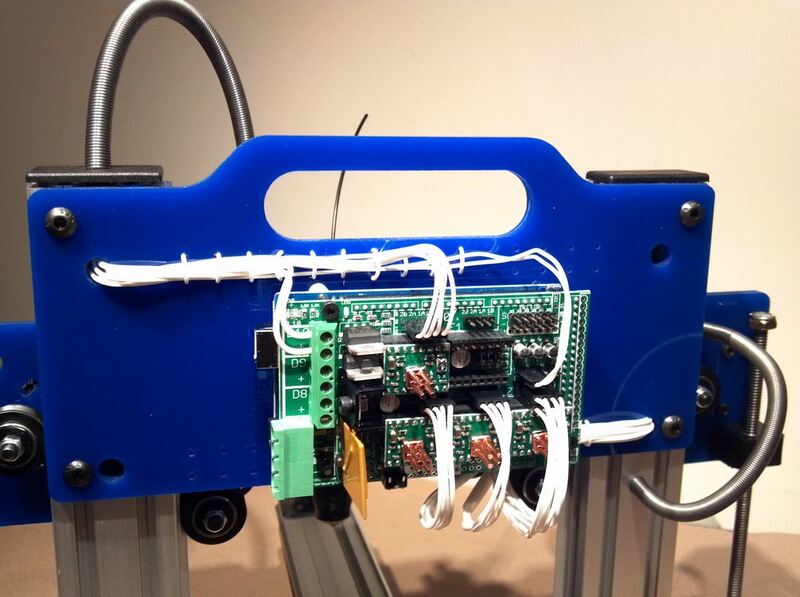 I am using a MakerGear extruder and a RAMPS controller. I will start with PLA on an unheated bed then add the heated bed. At this time I do not plan to sell a complete kit. It will just be the basic motion platform. I don’t have heads, beds or controllers. My target price is right around $200. It would include motors, belts, pulleys, hardware etc. This is a case of “If you build it they will come”. The design is sweet! 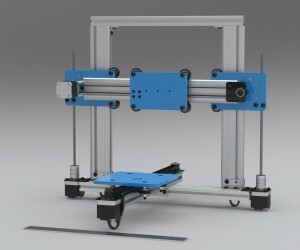 I have been sitting on the fence for some time about putting a 3d printer togeather. This design has finally tipped the decision for me. I will probably try to “kickstarter.com” it. Could you help and give some tips/advice concerning building process and materials? Like let’s say step by step instructions or parts list and prices etc. One more time: The Quantum ORD bot is so neat. It could be the next big step in personal fabrication. I’d buy a kit as well. This is better than anything else I’ve seen and I’ve been looking. I’m ready to pull the trigger on a 3D printer and I’d love to use this. If you can source heads and contoller board that would be ideal but if not could you put together a parts list for everything needed and where we might get them. Is there any way that we can be notified when you are ready to release the kit? Can’t wait! I will post a notice here, at Thingiverse and on the build log. Where do you source the carbon fiber? I only had a couple days to get this done so I picked it up at the local McMaster Carr. It was close to $50 for a 12×12 piece. I could probably get about 60 ORD Bot parts out of that though. The final version will be an aluminum bracket. The majority of it of course is Makerslide. The piece across the bottom is a Misumi 20×40 piece of Misumi, but there are dozens of similar companies that would work. BDring I am interested in a kit as well. I also would vote for th prusa mk1 size bed (upgrade option?) Makes it easy for me to scavenge parts from an existing printer. 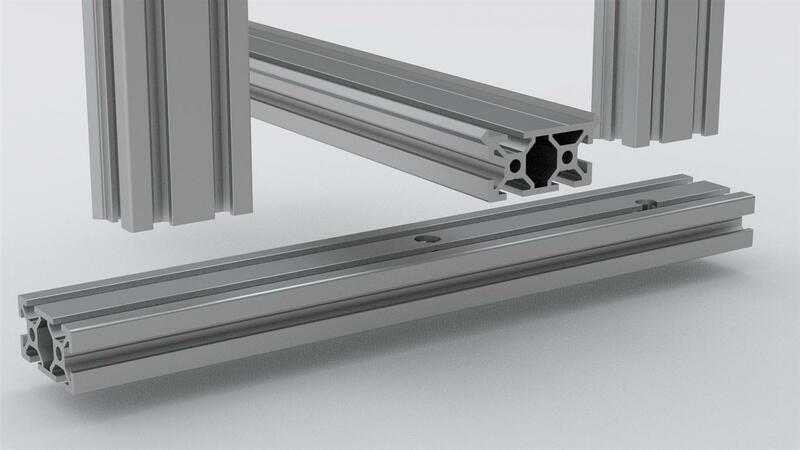 Another thought….since this frame is so ridged any chance to could handle a Dremel 225-01 Flex Shaft Attachment for convert to a cnc? The ORD Bot will be at the Chicago HackerSpace Pumping Station one (PS1) on Wednesday night. They have a monthly DIY CNC night that is free ($5 donation suggested) and open to the public. If you are in the area, stop by. I would love to get some feedback on the design. The brackets are now universal 14/17. This changed the motor mounts used for the 2 Z motors plus the Y motor. It also changed the two plates at the ends of the gantry. These have the universal mount and and need to get a little wider to deal with the slightly wide universal mount mounts on the Z. The Y motor is now at the back. This allowed it to use the same motor mount as the Z and cleans up the front of the machine as well as the wiring. I think the design is pretty much done for the quantum size. You can see the most recent rendering here. The most recent STEP file is here. Wow! So clean and beautiful! Please make this a kit. I highly recommend a Kickstarter Campaign. I can’t imagine you’d have much trouble getting funded. +1 for making kits. They would sell seriously well. Sign me up. I have been looking into 3d printers also, but cost is a major hurdle for me (missed the one on Kickstarter by 1 day gaaah!). It looks like your kits will not be terribly expensive, and it is the best looking one (I hate unorganized wires) IMHO. You have a winner here! Another +1 for a kit. 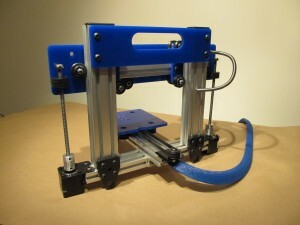 I have been waiting for the mendel reprap to be mated with some easy to use rail system for a while now. Now that makerslide is here it is the logical system to use. I browsed the comments here and they seem to mirror what I was going to say so I thought I would just throw a second up , for making it use the reprap as a standard. Having the maker slide would take out allot of the adjustments to get the thing square. If there is any interest?? INTEREST!! I will buy 1 when it is available!! Here it is printing it’s first part tonight. And here is a still shot measuring the first part. This should be 20mm across exactly. It is 0.07mm large, that is less than the thickness of a standard sheet of paper (0.10mm). It prints quite quickly and VERY quietly. What you hear in the background of the video is another 3D printer about 10′ away. It is very impressive. Great job Bart! And thank you Jeremy for helping getting it setup. Count me in. JUST TAKE MY DAMN MONEY! This looks AWESOME. I would absolutely buy a kit. I am also very interested and 200×200 build platform (or greater) would be perfect. I feel the huxley is on the small side. I am joining the already busy room of people hailing your design! I am in the process of up-scaling the design for 300x300x300 print area. 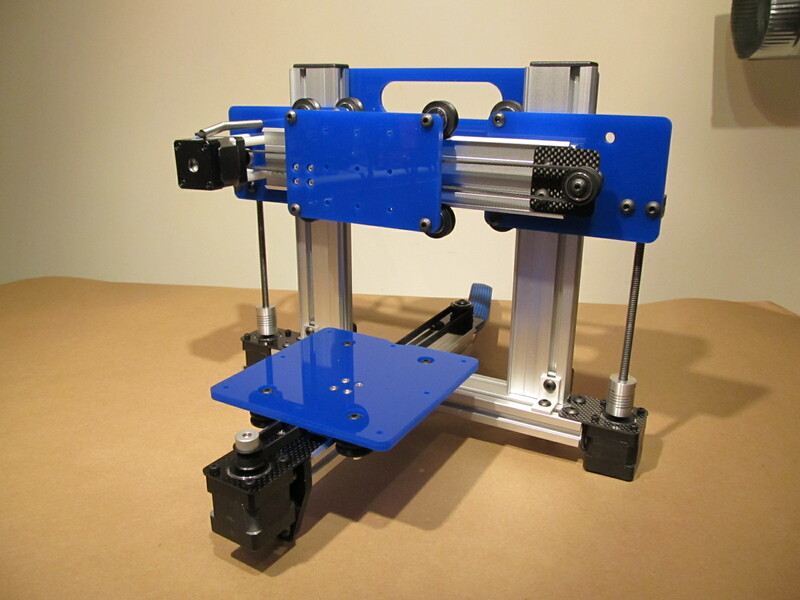 As your comments on kits go – only the print-bed will remain in 6mm plastic, all other custom parts will come in aluminum. Do you think adding +200mm at X-axis would already require a second MakerSlide excursion for suport? I am planing to start with one and see how it goes. Looking forward to your up-sized design. I am very interested also in the BOM! Can we have a detailed BOM? The BOM is about 80% complete. It will be done before the end of the day. It is about 4 hours work to do a good indented BOM with real part numbers and sources of supply. Watch this blog for notice of a release. Tnx, we really appreciate your job! A first draft of the BOM is in. It is close enough for me to switch to working on the drawings. The links to the drawings will show up as they are entered into the system. You print using STL files. There are plugins for Sketchup to save STL files. You can get a reservation for one of these at the Makerslide Store. 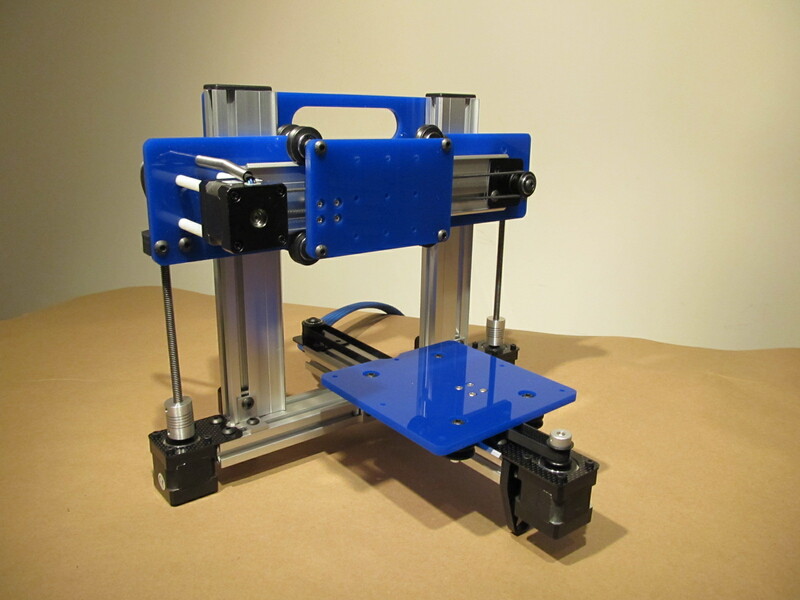 A complete kit including all the electronics, software , extruder ,hot bed… will ber avaiable on kickstarter in 2 days. The handle/electronic plate will be on order very soon. You might consider contacting me regarding your mounting hole pattern if it is different than the current design. Are the build instructions released yet? Can I incorporate Huxley’s electronics, extruder and hotbed into the Hadron? Very nice design, but over 300 bucks shipping cost to Europe (for extrusions only) is a little too much, thought. I’ll put my team of international executives right on it right after we finish emptying the dishwasher. I’m sorry, we seem to have misunderstood. As I sad, this is the best, simple, well thought-out and affordable mini-cnc design I ever seen. 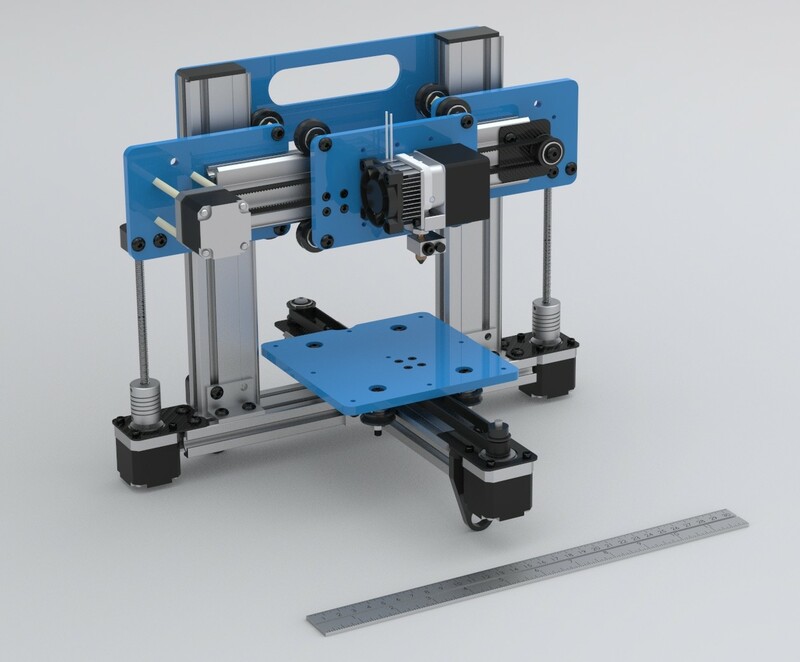 Therefore I was planing to build it, but the problem is makerslide extrusions, witch are unavailable in EU. Not even on e-bay. Furthermore, high US to EU shipping cost does not encourage. If You are willing to sell these separately, that’ll be cool! Good luck with your prodigious project and best wishes. The international shipping policy is outlined on this page of the store. For something like ORD Bot Parts international flat rate shipping is best which would cost about $60 (insured). You could get several set of parts into that box. The makerslide is on very limited release, so sign up for the store newsletter to got notified of releases. I’ve been influenced by store.makerslide.com shipping estimator, which said that price is $226.790 (UPS)for transportation. That makes me confused. I guess this shipping calc gonna be fixed. Anyway, I’m gonna ask you about payment method and shipping details over email. What about emptying your dishwasher? It looks like the Hadron has disappeared from the ordering page, is that right? Also, I saw something about a completed kit with electronics being on Kickstarter, is that going to happen? I would like to see a laser cutter! Thanks for building it! There is a Hadron being sold on eBay now. Hadron has arrived. All electronics have arrived (RAMPS, heated bed, etc). Need an extruder! The MK7 is sold out. I see you’ve used both the MK7 and the Makergear plastruder. Can you advise what to order? I have access to a machine shop (mills, laser cutters, etc) just incase. If I order a plastruder do I need something special from McMaster to mount it? Thanks. 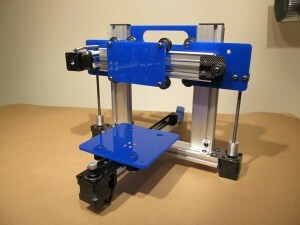 MakerGear Stepper Plastruder mount with no adapter or modifications. Please ask future questions on the buildlog.net forum. 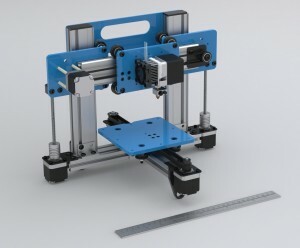 please tell me: how can i buy a complite set of this kit(3d printer)? i am waiting for more information. See this forum post on where to buy ORD Bots. thank you .as i see this kit does not include an extruder, a controller, stepper drivers, heated bed or any wiring supplies and electronic controller.if i buy this kit from you can you help me to find another parts. That supplier can supply some of those materials. I would contact them first. There are hundreds of posts on this subject on the buildlog.net forum. That is a much better place to ask these questions. The link to buy this on Inventables returns a 404 error. This entry is filed under 3D Printing, Digital Fabrication, DIY, Projects . You can follow any responses to this entry through RSS 2.0 . You can leave a response, or trackback from your own site.